Last night, we hosted a very special event at the stunning Hull Minster. Over 270 people turned up to celebrate with us, as we launched our partnership with Barclays Eagle Labs. If you missed out on a ticket, we've rounded up the evening below. But, don't worry, there's still plenty of time to get involved in this fantastic opportunity for the city and the digital community. C4DI startup bridges the gap between classroom and home learning by embracing the power of digital. Using a design-led, technology-driven approach, Hull House Group aims to make our city one of the happiest places to live. We spoke with Founder Steve Dam and Co-Director Scott Pilgrim to discover more about their work and how they are innovating the property sector through digital. Zero Day Security is the brainchild of Lukasz Jendraszek. Covering everything from penetration testing to emergency system recovery, the fully flexible service provides protection against hackers, leaks and unauthorised access. We caught up with him in our co-working space to find out more about the future of web security. Marketing specialist John Cant works independently to help start-up businesses with their initial establishment and early growth. We caught up with him in our hot-desk area to learn more about how he does it all, and which project he is focusing on at the moment. Sauce is a development team born out of the C4DI that comprises Matt Gibson, John Polling and Jim Wardlaw (pictured left to right). Together they work on web and app projects across a wide range of client sectors, bringing solutions to problems of all sizes. We met up with Matt to find out more about a current piece of work, which will help members of Hull University Union to make the most of their student journey. Happy Goon is an exciting startup that is based around high-quality greeting cards that you can buy online anytime, send them anywhere, and watch them come to life with the Happy Goon app. Their Kickstarter Campaign was successfully funded and they have great plans in store. The local partners driving forward the regeneration of Hull’s Fruit Market have revealed their vision for the £80m transformation of the city’s cultural and creative quarter. Regeneration company Wykeland Group and residential developer Beal Homes said the rejuvenation of the Fruit Market would see £70m of privately-funded development in Hull’s most significant urban regeneration project. The two long-established Hull companies have formed a joint venture company, Wykeland Beal, to breathe new life into the Fruit Market, in partnership with Hull City Council. 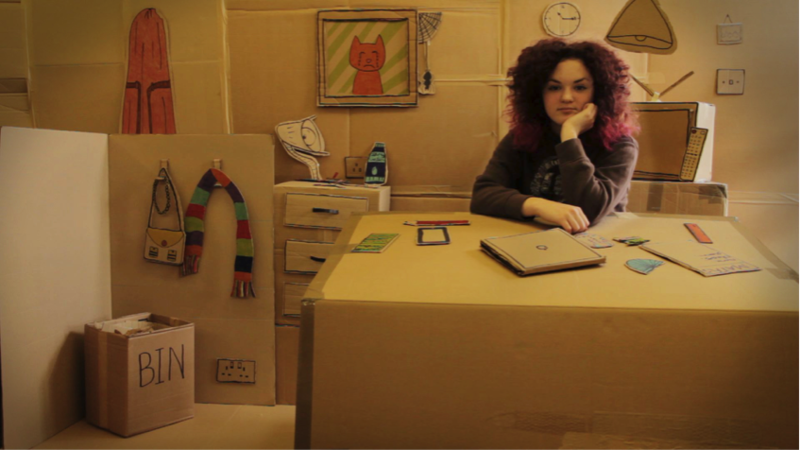 My Cardboard Bedroom is a new interactive film produced by C4Di based production company My Pockets. The film was commissioned by Hull City Arts to encourage young people to get involved in creative activities in Hull. My Pockets worked with a team of young people to devise, design, shoot and edit the film. They built a bedroom entirely from cardboard and created an interactive story where the viewer can make choices for the lead character, condemning her to a life of boredom or encouraging her to try something new. The film was created on the new innovative Interlude platform and has been selected for its featured projects page alongside films for Coldplay, Coke and MTV. HULL, 11th February 2016: Tech City UK, the UK government backed organisation tasked to accelerate the growth of digital businesses, along with innovation charity Nesta, today launch the Tech Nation 2016 report in partnership with core data partner, GrowthIntel. The most comprehensive analysis of the UK’s digital tech industries to date, Tech Nation 2016 underlines the economic importance of digital tech businesses, with the number of businesses in Hull growing by 24% between 2010 and 2014. Tech Nation 2016 found the digital tech economy has a strong impact on employment nationwide and is creating highly paid job opportunities, with 1.56 million people employed in the sector, including 6,070 in Hull. Stepping outside of the rat race and becoming a creative, driven entrepreneur has never been easier. The world's largest taxi company owns no taxis.The world's largest accommodation provider owns no property. The world's most valuable retailer owns no inventory. The world's largest movie house owns no cinemas. The world is changing fast - don't get left behind. We have unprecedented times in the city with a wave of confidence and opportunities: UK City of Culture 2017 coming round very quickly, Rough Guides featured Hull in the top ten global destinations in 2016 our thriving digital sector was highlighted in the top ten in the nation by the Tech Nation report. This is an unmissable event for anyone in the hospitality sector. If you run a bar, hotel, restaurant or café, then this is for you. Come along on Thursday 4th February at C4DI to learn to understand how technology is going to impact you (and how you can improve your business opportunities). We will be in the new C4DI theatre and there will be an opportunity for a tour too. To RSVP, just click the link below! We look forward to welcoming you! Ten essential fundraising methods for Startups - when to get investment and when not too! To begin with I'll start with a little bit about myself; I graduated from university last year and now work as a member in C4DI's team. Soon after graduating it became apparent to me that I really wanted to launch my own startup in the tech sector. As a philosophy graduate - I have had a lot to learn about business (and am still learning!). After doing a lot of research it became apparent to me that digital hubs were the place to be since they offered an environment most conducive for rapid learning, discovery, support and ultimately (hopefully), success. Three things make up a startup, Hackers, Hipsters & Hustlers. Hustlers are the individuals that make connections and ultimately help grow your business. To help you learn the way of the Hustler we arranged a talk with Bob Spence, who kindly agreed to share some of the secrets of his success with us. Bob is a renowned author of ‘Executive Programme in Professional & Business Networking’ and creator of E-Learning programme ‘Who do I speak to next’. Not only has Bob enjoyed immense success generating revenues & prospects but he also understands the methods of how he achieved it, condensing it all into an easy to understand formula. Entrepreneurs, startups, companies looking to export, Management teams looking to source international partners & anyone who has the ideas but not the connections, this talk is perfect for you. Hackers, Hipsters & Hustlers was held on Thursday 19th November, but if you missed it (or would like to recap) you can catch it on our YouTube channel. We'll now be recording all of our talks - now there are more ways to access our fantastic events and learn valuable business skills. C4DI member David Ripper has been working on a very exciting project called "CipherSent". What has been really interesting is that other members have been involved and the project only happened with the help of the C4DI member team! We are seeing this happen more and more with people collaborating on client work and also startup ideas. So, what is Cipher Sent? Have a read below! "Secure Matters Ltd, a software solutions company based at C4DI in Hull, has just released its first service. CipherSent makes secure file transfer simple. You can transfer sensitive data securely, simply, and quickly. To anyone, anywhere." CipherSent makes the process simple by automating it as much as possible. People just login, upload the files to be transferred, and then enter the details of the recipients. Files are always encrypted from the moment they start uploading. Strong one time passwords are automatically generated and sent to the recipients via SMS. A link to the files is sent via email. Files are automatically restricted so only the recipients can access them, and they’re automatically deleted from the service after no more than 30 days. If you want to learn more about CipherSent visit the website at www.ciphersent.co.uk, call them on 01482 240770, or drop them an email at hello at ciphersent.co.uk. John, our MD, went to Parliament earlier this week to discuss the importance of the Digital Economy for Hull. 'Days that Made Us’ is a creative project run by C4Di member, My Pockets. The project challenges people to choose and describe the one day of their life that made them who they are. The most recent phase of the project has worked with members of the Merchant Navy in Hull. The stories include a man who fell into shark infested waters and watched his ship sail away over the horizon, a teenage boy who bought a gun to shoot his own father and a seaman who fell in love and never returned to the ocean. These stories have been supported by Roots and Wings, Hull Libraries, Untold Stories and the James Reckitt Library Trust.